The positive is Peluso only played 4:23 and 5:16 in his 2 previous games this season. That means more icetime for Gaudreau, Tkachuk, and Bennett specifically as the other LWers. I love the punching of faces! I hope Peluso fights every Duck tonight. Yea, he is a good piece for tonights game, he has a "particular set of skills" that are useful from time to time. I like how he plays, tough customer and he was good on the forecheck/cycle when he was up last. *groan* I can't muster more of a response than that. Peluso wasn't horrible in his previous game. So Curtis Lazar couldn't even make an forward AHL call-up. Does anyone even remember we have him down in Stockton? This move makes sense. 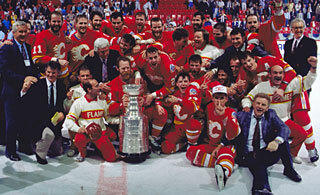 Anaheim has a history of taking liberties with the Flames. What's interesting is that Peluso hasn't gotten into much trouble in any of his appearances. He hasn't played much but hasn't been a tire fire. But he also hasn't done anything remotely close to his role either ... face washes, shoving matches, physical play or a scrap. Hathaway is by far the worst Flames forward when it comes to metrics but he's a pissy ball of hate pretty much every night. Ducks are struggling. What does it say to your guys when you insert a fresh from AHL goon in the lineup to play an opponent that's been stinking things up of late? This is the kind of move teams make when opponents are in their heads as they are putting too much thought into this. All they have to do is go out and play their game as they have most nights this season and they will win. As Bingo said above I don't think he's going to overly hurt them so I'm not going to lose any sleep over this but it just seems a little unnecessary. This is the only reason I can think of that makes any sense. Agreed, wouldn't be opposed to inserting Dalton Prout either, to patrol the blueline, maybe even Michael Stone too, and let the young D watch a game. Last edited by David Struch; 11-07-2018 at 02:55 PM. Stone hasn't fought since 2011 in the minors against Mark Cundari. And before that, just 2 in junior. He ain't a tough guy. Given the emergence of Valimaki and Andersson it only makes sense to send Prout down, since Stone is the 7th dman right now. I think/hope that's what we see when Dube is ready to come back. Prout down, Peluso stays on the roster. The Oilers don't need a Giordano. They have a glut of him. He ain't a tough guy. I never said he was a scrapper, I've seen him lay the body on other big boys his size though, 6' 3 210 lbs. Prout should be sent down. I'm not sure if this recall will put the Flames in a situation where Peluso needs to go through waivers this time to be sent down but if so maybe they should consider sending Prout down instead. Stockton could use help on defence more so than they need Peluso.. If they are worried about losing him I don't really get it because he has spent the majority of the last few years in the AHL so I'm sure he isn't much of a risk for being claimed. Unless they are wanting to trade Stone I don't really understand the logic of keeping Prout up.